It’s a simple story, really. After a young baker (Tyler Padgett) and his wife (Hannah Brown) take over the family business, they decide to have a child. The problem is they’re broke. In the modern science age of expensive in vitro fertilization that would be a very big problem, indeed. In Stephen Sondheim and James Lapine’s brilliantly conceived musical “Into the Woods,” now being performed by the Tennessee Valley Players, with the University of Tennessee School of Music at the Ula Love Doughty Carousel Theatre at UT, the young parents-to-be need only to go from one fairy tale to another collecting the list of things the Witch, craftily played and sung by Chevy Anz, tells them is the secret to getting pregnant. a) the over-protective mother who knows just how evil the world can be. So she keeps her child locked away to protect her, just the way the Witch locks her daughter Rapunzel (Zoee Lyle) in a tower; b) the mother who is afraid her child isn’t smart enough to fend for himself, just the way Jack’s mother (Ryan Colbert) hovers over Jack (Jack Francis) so he won’t make a mistake like selling his cow (which he can’t figure out is a she) or planting magic beans; c) the grandmother (Logan Williams) of Little Red Ridinghood (Roxanne Cabrera) who teaches her how to be alert and careful, but go buy bread from the baker; and d) Cinderella’s stepmother (Julie Howard) who treats Cinderella (Hilary Hohl) like a slave so her own daughters, Florinda ((Rachel Metzger) and Lucinda (Laura Buckner) can pretend to be princesses. The magic of “Into the Woods” is weaving all of these characters into the same story. Add Cinderella’s henpecked father (Wade McGarity) and mother (Susan Bolt), Rapunzel’s Prince (Michael Hines), Cinderella’s Prince (Brett Hopper) and his steward (Collin Kasefang), the Wolf (doubled by Brett Hopper, who comes close to stealing the show in his brief scene trying to seduce Red Ridinghood) and a Narrator (William Bolt) to help make sense of these interwoven stories. Director Kate Laciak does an admirable job keeping all of these characters moving on and off stage from the Carousel’s four entrance points. Needless to say, the action sizzles, especially Cabrera’s Ridinghood is bouncing around the stage or when the princes are in a frenzy. And the singing, under the direction of Dr. Angela Batey, often goes at tempos that take all of the breath in the room. 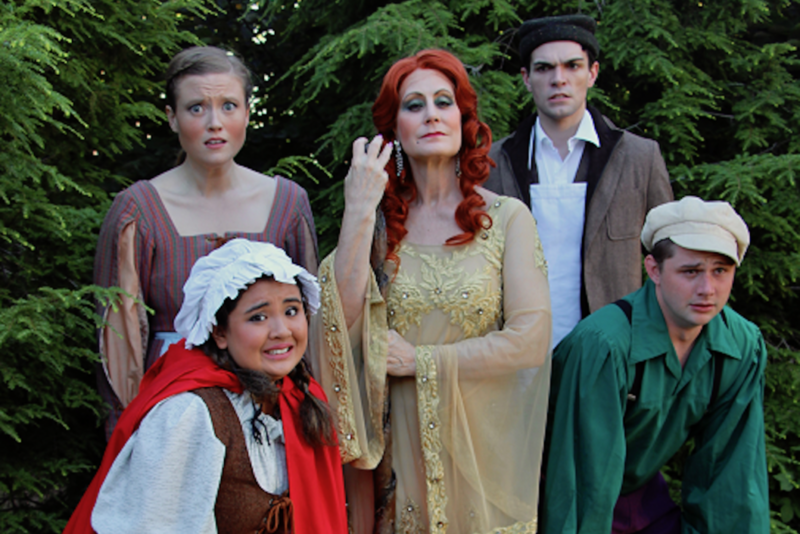 Into the Woods plays at 7:30 June 15, 16; 21-23 at 7:30 p.m.; and June 17 and 24 at 3 p.m.